Anoka County Master Gardeners in the Writer's Guild provide a gardening column each month to two local newspaper publishers. Articles are seasonally current and reflect a wide variety of educational subjects. Gardener’s Grapevine is published by Quad Community Press which has a circulation of 19,265 in Lino Lakes, Forest Lake, Circle Pines, Shoreview, Blaine and Lexington. Garden Views is published in the Anoka Union which has a circulation of 4,400 and Blaine-Spring Lake Park Life with a circulation of 16,000. Other articles are archived here. What a winter we’ve had! In the metro, we had adequate moisture going into winter. We had below normal temperatures in October and November with scant snow cover in December. We’ve had heavier snows in January and February with 300% higher than normal precipitation. But why a weather report when we’re talking lawns? All of this weather can change what you need to watch for this spring in your lawn. In November and December, ice cover on the lawns for extended periods may have prevented oxygen and carbon dioxide exchanges the grass needs – essentially suffocating the grass. 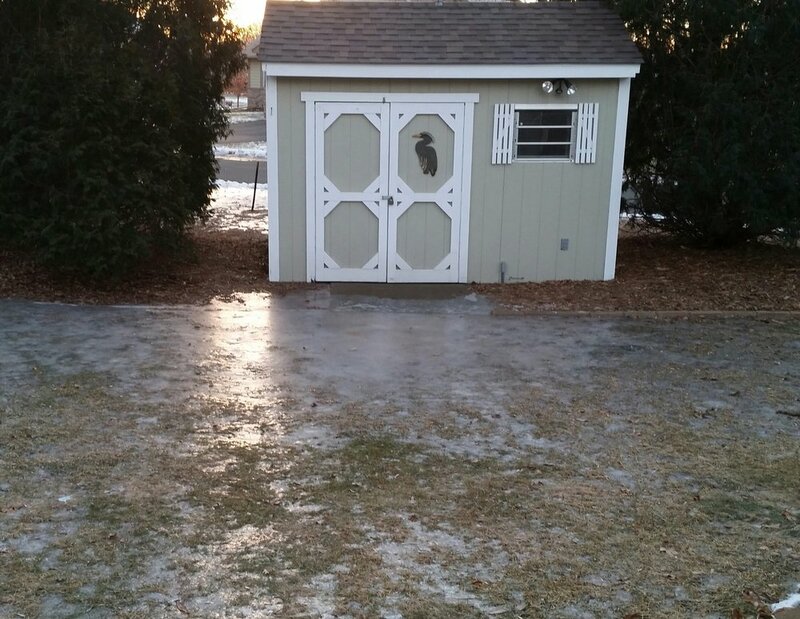 Did you notice low areas in your lawn that held pools of water and ice earlier this winter? Early low temperatures with little snow cover can keep a grass plant from acclimating properly to the cold. Rapid freeze-thaw cycles during acclimation can allow ice to form in a plant and burst cells. There could have been early damage, but we’ve had very adequate snow cover since January to moderate later temperature fluctuations. Potential threats are still to come this winter if we have freeze-thaw situations while the grass is de-acclimating the next couple months. Again, watch for issues in low lying or shaded areas. Diseases that have good potential this year will be both grey and pink snow mold. Grey snow mold will show up where there is excessive snow cover; pink snow mold doesn’t require snow cover. There’s no need to use chemicals in these areas, but rake the diseased plants out. If you have bare patches, reseed. Here are a list of things you can do to prevent more damage to your lawn: Minimize traffic this spring where there may be frozen soil or frost on stems and leaves. Let your lawns dry out this spring before you work on them. Keep heavy equipment off the lawn until then. If you need to reseed this spring, you can lightly rake the soil, reseed and use new lawn fertilizer while the ground is still defrosting. If you have lawn that’s mostly Kentucky bluegrass and if the patch isn’t bigger than the size of your palm, it should fill itself back in. If you have a lot of fescue, you’ll likely need to reseed. Even creeping red fescue isn’t as aggressive as Kentucky bluegrass. If you reseed this spring and you need to treat for crabgrass, look for a pre- emergent under the name of Siduron (Tupersan). It’s the only pre-emergent that won’t stop your grass from germinating. Treat only areas where you’ve had crabgrass, not the whole lawn. Wait for soil temperatures to reach 55 degrees in the upper 1-2” of soil for several days before applying to the lawn. Then, this fall, apply adequate but not excessive nitrogen fertilizer around Labor Day. Make sure the grass isn’t putting on excessive shoot growth too late into the fall. Improve drainage if you have standing water anywhere in your lawn. Improve sunlight in areas of your lawn that don’t get a lot of sun or replace grass with some other kind of plant. We can help! The Master Gardener Hotline will answer your gardening questions year round. Call (612) 301-7590 or send us your question online. What’s wrong with my plant? © 2019 Anoka County Master Gardeners. All rights reserved.